Published: July 1, 2016 at 12:09 a.m. Updated: July 4, 2016 at 12:55 p.m.
David Johnson set a franchise rookie record with 13 touchdowns last season. Not bad for the Cardinals' fallback option on the 2015 NFL Draft's second day. In the Amazon Prime video series All or Nothing: A Season with the Arizona Cardinals, which debuted Friday, we discover that Arizona's war room had zeroed in on shifty tailback Ameer Abdullah with the No. 58 overall pick in the draft. Crestfallen when the Lions swooped in to steal the Nebraska star at the last minute, general manager Steve Keim ended up "settling" for Johnson one round later with the No. 86 pick. While Abdullah has a bright future in his own right, the Cardinals couldn't be more thrilled to have the more physical Johnson leading their backfield. During the team's 38-8 blowout victory over the Green Bay Packers in Week 16, All or Nothing's cameras caught All-Pro defensive back Tyrann Mathieu comparing the rookie running back to one of the best players of the 21st century. "He kind of reminds me of Marshall Faulk," Mathieu raved on the sideline. "But he's just bigger than him." Mathieu shares a New Orleans heritage with Faulk; this is not a comparison he makes lightly. It's not the first time Johnson has been mentioned in the same breath with a Hall of Fame talent. Venerable Cardinals offensive consultant Tom Moore has compared the former Northern Iowa standout to former Steelers great Franco Harris for his unique combination of size, speed, power and receiving ability. After hearing an awestruck Keim marvel in mid-February about Johnson's "scary" potential as a three-down back with rare size, speed and natural receiving ability, Around The NFL asked coach Bruce Arians at the NFL Scouting Combine if his new backfield weapon might already be one of the league's best all-around running backs. "I can't say after one year's work that he is one of the best," Arians replied, "but he's got a chance to be one of the all-time best." The production is already there. From the time he entered the starting lineup in Week 13, no NFL player averaged more yards from scrimmage per game than Johnson's 131.7. The freakish athleticism suggests the best is yet to come. Per Next Gen Stats, Johnson recorded the fastest speed by a running back as a ball carrier in 2015. The 6-foot-1, 230-pound wonder also launched an astonishing 41.5-inch vertical leap at the Scouting Combine. Johnson is the rare back who can pound out tough yardage between the tackles, break into open spaces for long gains and run routes like a wide receiver. That package was on display in the postseason, as Johnson revealed that the Packers started shadowing him with a linebacker, switched to a safety and ultimately resorted to double-covering him by the end of Arizona's thrilling Divisional Round victory. It's that dual-threat ability that inspires comparisons to Faulk, who became the first player in NFL history to top 2,000 yards from scrimmage in four consecutive years. Faulk's greatness went beyond his multi-purpose versatility, however. On a team loaded with Kurt Warner, Torry Holt and Isaac Bruce, the transcendent Faulk was the focal point of Bill Belichick's masterful "Bullseye" game plan in Super Bowl XXXVI. Johnson has already flashed the physical tools to reinforce the glowing praise emanating from the desert. He has a long way to go, though, before he matches Faulk's unparalleled instincts, vision and suddenness. 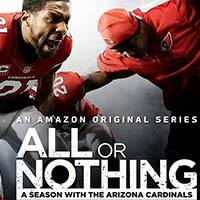 Stream the Amazon Original Series "All or Nothing: A Season with the Arizona Cardinals" on Amazon Prime Video now at amazon.com/allornothing.